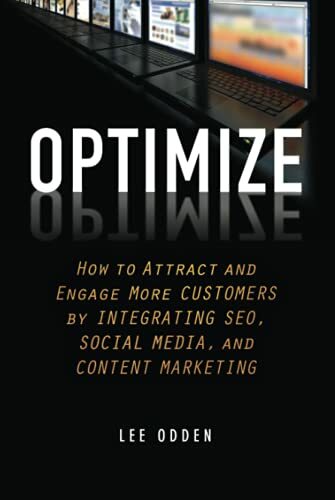 Attract, engage, and inspire your customers with an "Optimize and Socialize" content marketing strategy Optimize is designed to give readers a practical approach to integrating search and social media optimization with content marketing to boost relevance, visibility, and customer engagement. Companies, large and small, will benefit from the practical planning and creative content marketing tactics in this book that have been proven to increase online performance across marketing, public relations, and customer service. Learn to incorporate essential content optimization and social media engagement principles thereby increasing their ability to acquire and engage relevant customers online. Optimize provides insights from Lee Odden, one of the leading authorities on Content and Online Marketing. This book explains how to: * Create a blueprint for integrated search, social media and content marketing strategy * Determine which creative tactics will provide the best results for your company * Implement search and social optimization holistically in the organization * Measure the business value of optimized and socialized content marketing * Develop guidelines, processes and training to scale online marketing success Optimize offers a tested approach for a customer-centric and adaptive online marketing strategy that incorporates the best of content, social media marketing, and search engine optimization tactics. "Blending the gears and guts of search with the passion and artistry of content is a brilliant move. If I were lazy, I could cheat and use Lee Odden's book as my road map for this coming year's business." "Content, search, and social are like the Three Musketeers of Marketing. Optimize shows you how—in very specific, measurable ways—you can put them to work for your business." "Optimize is a manifesto for how to think about your business and your life in today's always on, always sharing world we live in, as well as a guide for putting practical social media and content marketing advice into action." "Lee Odden has unparalleled insights that teach professionals not just the 'why' of a holistic digital approach, but actually 'how' to maximize the ROI and engagement value of their SEO, content, and social media campaigns. His deep expertise and the practical, easy-to-understand steps included in Optimize make it a must-read!" "Content marketing has been a hot subject recently, but what good is your content if no one can find it? Odden takes a methodical and thorough approach to this important aspect of content marketing. Whether you're from an agency or a brand, you hold in your hands the playbook you'll need to run an effective program." "Lee Odden understands better than just about anyone that content, social media, and SEO are all part of one continuum when it comes to effective online marketing. Now with Optimize, he spells it all out for you, clear as a bell. Read this book before your competition does."